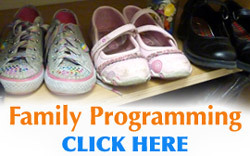 Family and Children’s Programs in Northern California are designed to nurture our community. Offering a space for children to come together with each other and experience their own dignity and bravery, we honor children as fundamentally wise and invite them to be just who they are. 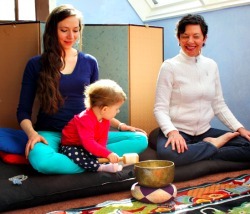 We also provide a way for parents to explore their personal practice and personal wisdom by offering children’s programming at the same time as adult programming. We invite parents to explore parenting as path by connecting with one another, attending classes, and sharing this journey with their children. Family Day in Sonoma every Sunday, featuring a children’s program while adults are meditating. Children’s Program the first Sunday of every month in Davis. 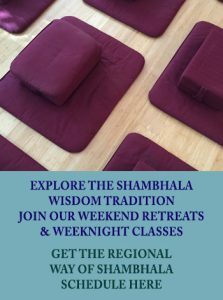 Shambhala Teen Space, online monthly on a Wednesday evening, and live in Berkeley monthly on a Sunday afternoon. Details here. Growing Brave is a monthly online overview and discussion of programs and resources currently offered in Shambhala. More information can be found here. Find The Playground of the Warriors, by Rees Sweeney-Taylor, here. More Shambhala Times youth and family articles here. Chogyam Trungpa, at the opening of Alaya Preschool in Boulder, Colorado in 1978.